Last year, the Japonismes 2018 project was carried out in France to introduce the food culture of Japan to the people of that country, with the aim of getting them to learn, enjoy and think about it. 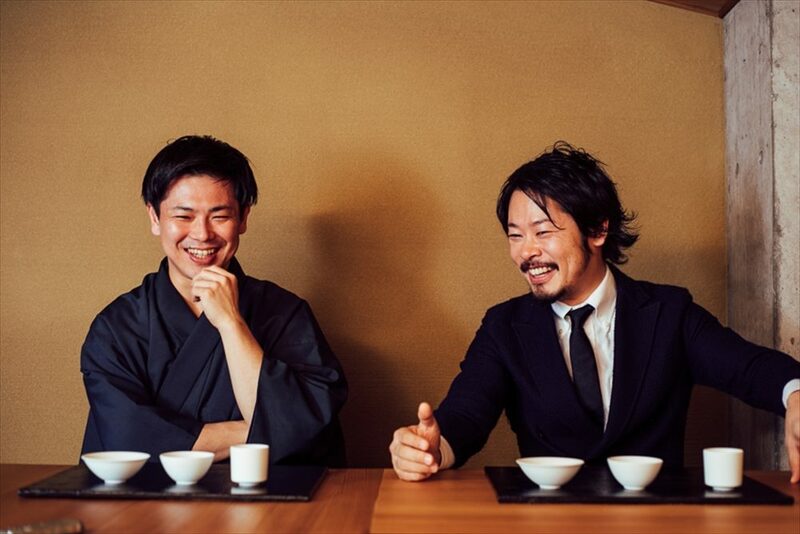 Taking part in the Japanese Culinary Culture part of the project were the mixologist Shuzo Nagumo and the sake gastronomist Yusuke Miyashita. 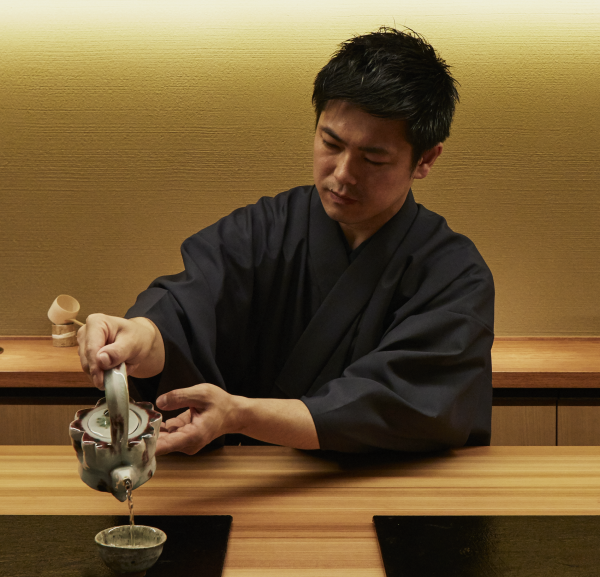 Following their talk in Part One, we asked the two men what they wanted to tell the world about the charm and fascination of Japanese tea and sake, as well as their future potential. ―What do you think should be done in the future to further enhance the interest in Japanese culture by people outside of Japan? Miyashita: Japanese pottery, the history of which stretches as far back as that of Japanese sake, is intimately related to sake and food culture. I think we ought to make an appeal for the elements of Japanese culture in that area as well. Alcoholic drinks are perfectly situated as an “entrance point” to getting people interested in the culture of a certain country. Once you get people to experience alcohol, not just as a drink but also as a way to personally experience the depth of its culture, it can serve as the opportunity for them to also develop an interest in pottery, while someone else may become interested in the tea ceremony, and some others may even come to develop a fascination in kimono, or architecture, or theater. Indeed, I think that it would be wonderful if the Japonismes 2018 project held this time helped increase the number of people interested in various types of Japanese culture. Nagumo: That’s because the French really love culture! There are a lot of people in that country with a firm cultural grounding. Still, I thought it was important to properly tell them about the message we were trying to send—be it tea or sake—and get them to personally experience and understand it viscerally as well. Miyashita: The message won’t get across unless you do that, right? Also, while it is important to get people to experience original Japanese culture, I feel that is not enough in itself. Because each country has its own unique history and culture, I believe in that context that it is absolutely necessary to make in-depth proposals about how to introduce Japanese tea and sake and how to enjoy them. Nagumo: How do you, Mr. Miyashita, intend to get people outside of Japan to enjoy sake in the future? Miyashita: Globally speaking, the tastes and flavors of various cuisines are converging toward a golden mean. With even French cuisine increasingly coming to incorporate the essence of Japanese cuisine, one can argue that the boundaries between different cuisines are disappearing. If that happens, the opportunities for sake to flourish in restaurants around the world—and not just Japanese restaurants—will expand as a matter of course. Nevertheless, it has not been until quite recently that people have come to consciously pair and enjoy sake with food, even in Japan. I am sorry to say that it is impossible to assert that the service methodology for sake has been systematized as of yet. Just to cite the okan as an example, if you asked one hundred experts about its proper handling, you would likely get one hundred different responses. There is no way, then, that a global expansion of sake could take place under the current circumstances. For that to happen, it would first be necessary to develop a proper systematization of the service methodology for sake—just as in the case of wine—by which it could be explained using a common language and expressions in a way understandable to anyone. I recognize that, also, as my role. We cannot overlook the global phenomenon toward low-alcohol drinks, and I also would like to learn, by all means, from the ideas about Japanese tea and cocktails that Mr. Nagumo is working on. Nagumo: The position of cocktails that are made with tea is still nothing but a “curve ball” (that is, something surprising or unexpected). My target is to make tea-based cocktails a “world standard” in a decade, and I hope to carry out various activities toward that end both in Japan and elsewhere. As I would like to use domestically-produced tea leaves in tea cocktails, I am also consulting with local tea farmers in Japan. Since the tea producers are undergoing a generational change as well, they are becoming closer to us in age, so I am planning on jointly developing tea leaves with them that can be used in combination with alcoholic drinks. Just as there are tea plantations now that make tea especially for use in disposable plastic bottles, farmers may appear in the future who specialize in making tea that can be used with alcoholic drinks. If that happens, it would boost tea exports, wouldn’t it? In addition, given that cocktails are accepted everywhere around the world, I would like to open establishments abroad that adopt the unique characteristics of each country, while giving seminars such as those that took place this time at Japonismes 2018. I am also thinking about inviting tea farmers to such events, and getting people not only to try out the cocktails but also the individual teas themselves. I would also like to collaborate with chefs in other countries as I go about my propagation efforts bit by bit. Miyashita: That’s an interesting notion: exporting cocktail recipes together with Japanese tea! Just as you said, Mr. Nagumo, it’s highly important to establish bridgeheads overseas, and that goes for sake as well, I think. Although exports of sake from Japan are on the upswing, the bulk of that is accounted for by a few major manufacturers, with those of so-called jizake (smaller local brews) remaining at the incipient stage. I think that jizake brands, each with its unique personality and taste, would definitely give overseas customers a different image of sake than before, especially compared with daiginjo (top-quality sake brewed from rice grains milled to 50 percent of weight or less), which is the synonym for high-class sake. However, it’s also true that jizake is not such an easy type of sake to understand as is daiginjo. That makes it critical to create an environment overseas in which people can experience and learn about Japanese sake culture. We must make the proper appeal there for the attractiveness of different regions and types of jizake. While that role can be partially fulfilled by overseas importers and distributors, there is nothing better than for there to be a spot, if possible, where such appeals are made directly. In addition, if that can happen, then it will become natural for foreigners to make trips to local areas in Japan in order to visit small sake breweries, just as Japanese oenophiles travel to France to visit small wineries in Bourgogne, for example. For the purpose of building up a set of core fans worldwide as well, I believe it is extremely important to set up bases overseas to broaden the base, so to speak. It would be even more wonderful if your activities with tea, Mr. Nagumo, and not just those dealing with sake, could take place there as well. What kind of role do you think that overseas bridgeheads should play in actuality, Mr. Nagumo? Nagumo: Focusing on tea and cocktails, I think that is important to not be swept up by trends and circumstantial changes, but rather to always concentrate on providing the essence, and then to continue to make changes gently. I think it would be wonderful if we become able to create spaces in each country where people can touch and enjoy tea, then go on to develop them further in line with the respective country’s characteristics. As happened before with 19c Japonisme, the incorporation of Japanese culture into another country will cause the two countries’ cultures to mix, thereby developing a new culture. France has its own special way to relate, enjoy, and spread culture, as does the United States, and I think it is our job to see how much we can support those efforts. Now we are still at the stage of information transmission. The end point, though, definitely has to be the fusion of cultures. Nagumo: I want the same thing to happen with tea-based cocktails, and will spare no effort to that end. As for the rest, in order to pass on that amount of technology, there needs to be quite a bit of linguistic skill, and training is indispensable, too. An important theme will be to develop human resources. Miyashita: Insofar as the importance of getting personnel who can provide service properly, sake is no different in my opinion. Now, with the generational change taking place at sake breweries and the improvements being made in brewing technology, it’s becoming even harder to find sake brands that are not good-tasting than it is to find delicious sake. Moreover, thanks in part to developments in distribution, you could say that there no longer exists any sake brand that is impossible to get. If it comes to that, people don’t need to go through the trouble of making their way to a restaurant and paying exorbitant prices for the same kind of sake that they can enjoy at home; that’s what people will wonder about once again. Rather, I believe that the role played by people in charge of service—namely, determining how much value will be added, as well as what kind of world view will be transmitted—will only grow. Also, and this relates to what Mr. Nagumo just mentioned about tea growers possibly emerging who specialize in tea for use in alcoholic drinks, a new kind of sake might develop once the level of service providers improves in quality and once brewers properly get feedback from them about their knowhow. The true development and maturation of Japanese sake culture, including that in overseas markets, have yet to happen. Nagumo: Japanese tea and sake are both substantial weapons, and there is no other business tool as strong as they are. I believe that it is our job to draw out their potential. I thank you deeply for coming today. My only regret is that we only carried out a dialogue, without being able to enjoy an actual meal here. Miyashita: It’s me who should be the one thanking you! 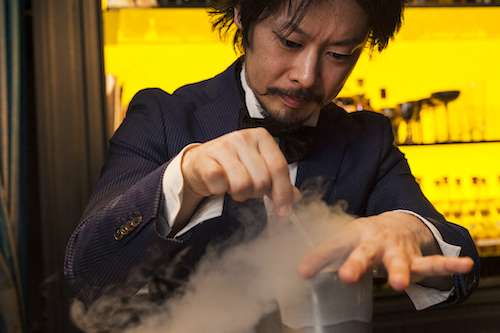 The next time we meet, let’s first drop in on Fushikino Restaurant and enjoy a pairing of the food with sake, to be followed by a second stop at your bar, Mr. Nagumo, where we can enjoy drinking tea cocktails together.